You know how I feel about festivals, yeah? Let’s just say that in general, I’m not a fan; too many people, bad sanitation and overdraft-inducing prices for food and drink. Walled Garden promoters Mel Fordham and Gardie Grissell have cottoned on to the fact that there are people out there who love music but don’t like squalor. 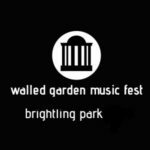 The Walled Garden festival has a capacity of 2,000 (about the capacity of most the venues on the O2 circuit), beautiful acoustics and it’s part of the Brightling Park estate in East Sussex with a variety of camping options including the inevitable glamping. The festival bill has an eighties/nineties bias and includes ABC, Embrace, Howard Jones, Jennifer Paige, Beverley Craven, Toploader and many more spread over three days (Friday 14 – Sunday 16 July) and you can find more information here. Me, I’d be there on the strength of ABC and Embrace (and Howard Jones is still pretty good live these days) and the beautiful setting.